There’s no sense in beating around the bush here, I do not like this ink. Black is just not my ink color especially not one that shades. As a matter of fact, I no longer have the bottle. Last year I traded it to a fellow FPNer. I’ve had this review written up for quite some time, but I couldn’t bring myself to post it. That is, until I saw a thread on FPN about a member looking for an ink that writes similarly to his favorite rollerball refill. Decent flow and lub, but there is a dry feeling about it. *Laughing out loud* And here I was gearing up for you to praise this ink! 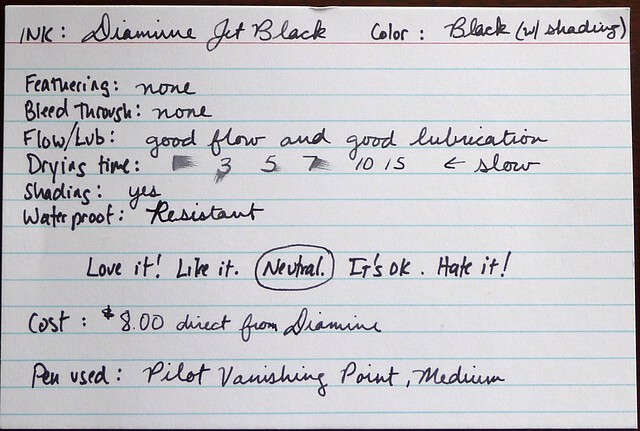 I, too, am unimpressed by Diamine Jet Black. Unlike you, though, I like a good black ink. J. Herbin Perle Noire comes to mind. I’ll confess I really like Diamine Grey which might drive you a little mad. 🙂 I’d like to give Diamine’s Onyx a try. I hear great things about Perle Noire. If I were in the market for a black ink that would be the one I’d purchase. As it is I only own one bottle of black ink: Cross Black. It’s not bad, and is fit for occasional use. Quick Question: did you use the Diamine Jet Black for the categories as well (e.g., “feathering,” “bleed through,” “cost,” “pen used”)? The black used for the categories seems darker. The categories were written with a Sharpie pen. Thanks for the great review. I am a black fan but have not tried many bottled blacks other than Noodlers since there are so many great colors out there!